1. 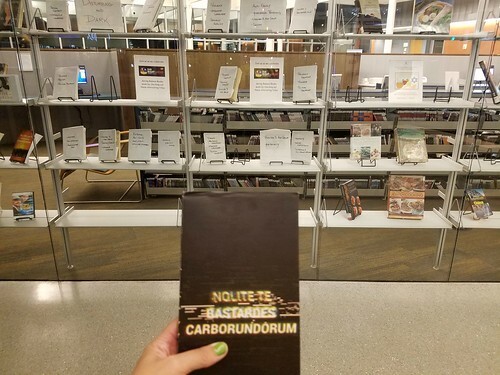 I’ve found Halloween stickers, a missing knitting project, paperwork I’ve been hunting for, and The Handmaid’s Tale, one of the banned books the D.C. public library hides around town as part of its Uncensored D.C. celebration. 3. Twice this week, I’ve come home from evening volleyball games and immediately hopped into the shower. When I get out a few minutes later and put on pi’s, I just feel so cozy and relaxed. How about you? What’s been beautiful in your world lately? Check out other people’s three things (beautiful or otherwise) at Carole’s. This weekend was a busy one. Rudi and I began it with an outdoor showing of last year’s version of Ghostbusters, which we enjoyed just as much the second time as the first. 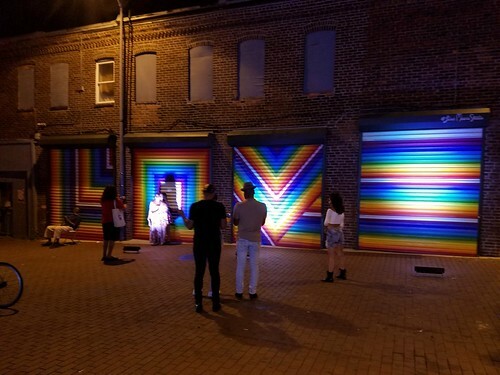 On Saturday, I began the day slowly, sleeping in, but with an agenda: Saturday was Art All Night D.C., the sixth annual event modeled after Paris’ all-night cultural party, Nuit Blanche. 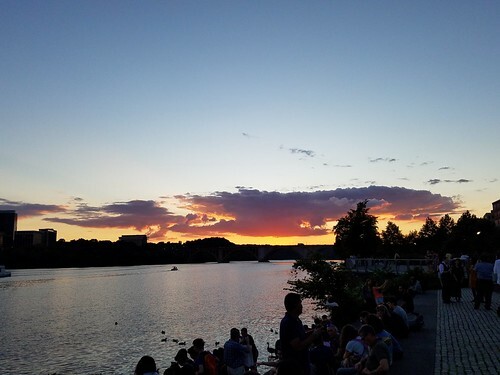 D.C. lacks the night owls of Paris, though, which means that its event was scheduled to run 7 p.m.-3 a.m., with various locations signing off early as so moved them. 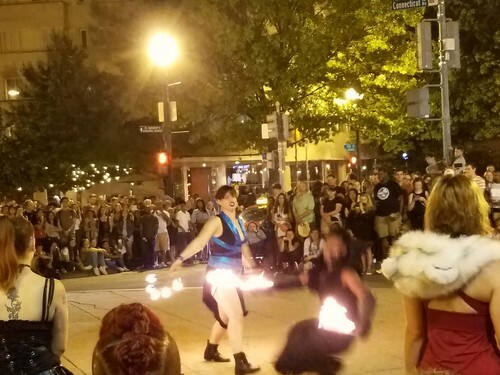 We started out down the street with fire twirlers, costumed players taking each other on with flaming weapons, in a cross between a Renaissance Fair and WWE. We moved on to our local chai bar, where we got to listen to a d.j. playing Hindi music, check out a couple of artists’ work (including one with giant luxo lamps), while partaking of some tasty beverages. We moved on to the next neighborhood, where we found the garden center already closed, but the coffee shop open. 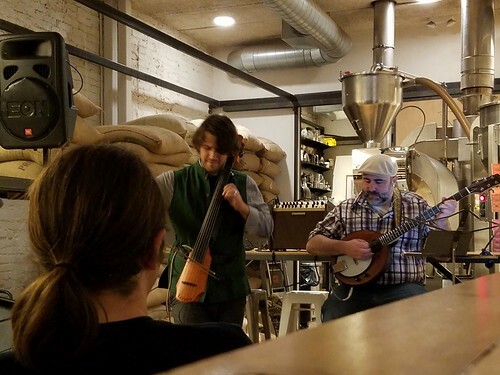 We were treated to a concert by Wytold, who play electric cello and banjo. They perform many of their own works (we bought a cd! ), as well as mashups, including one of Tupac mixed with the theme from Jurassic Park. 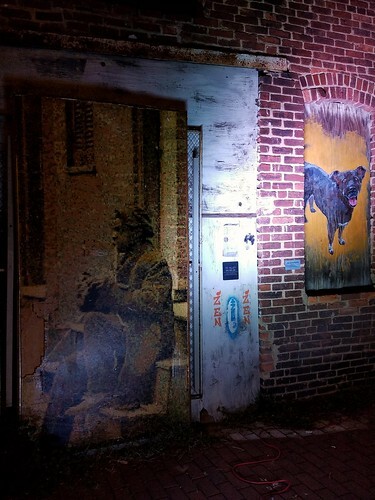 After hanging around there for a while, we moseyed down to Blagden Alley to the D.C. Alley Museum, where there are a bunch of murals, which were being illuminated for the first time. It’s really amazing how diverse these creations by talented street artists were, ranging from portraits to abstract artwork. We also got to go into a hip p.r. agency, where a jazz band was performing. We moseyed up to the Shaw Library to use their bathroom just before midnight, then crossed the street to check out the artists selling their wares in an empty lot, headed into a parking garage for a dance party/mobile bar, and passed any number of artists on the street and in businesses dancing, showing their art, and demonstrating body painting. Our final stop of the night was Sugar Shack doughnuts, where we found the selection picked over, but still delightful, particularly when the counterman gave them to us for free. 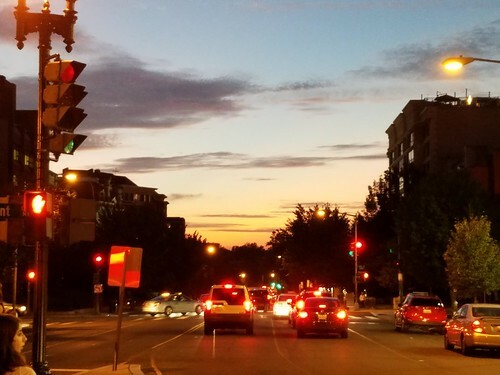 We headed back to Dupont with the hopes of finishing the night at art events in our own neighborhood, but they all seemed to have closed far earlier than the 3 a.m. ending time led us to believe. We were tuckered out from all that walking though, so were just as happy to head home for the night. 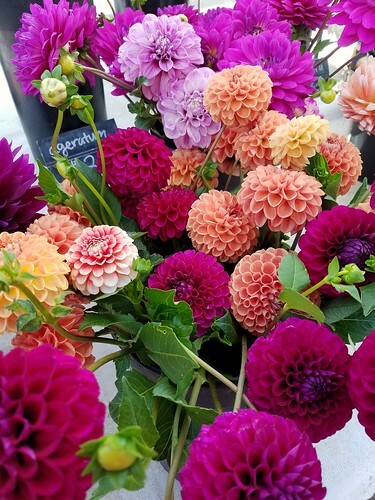 This morning, I got up early for the farmers market and then spent the afternoon sweltering at the D.C. State Fair. 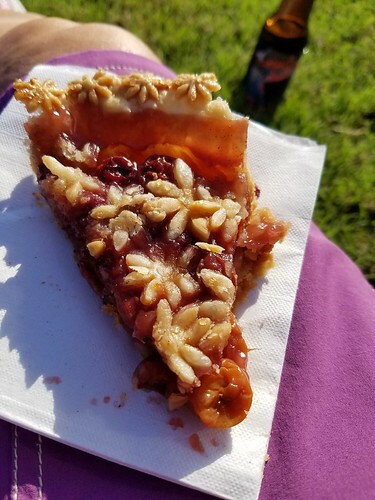 I ate local pizza, drank local root beer, and consumed a slice of cherry pie, a contender for the best home baked pie category, that was both a treat for the eye and the palate. I bought a new dish towel, and after wandering off to the local branch of the library, a pile of books and dvds from their Friends-of sale. We concluded the evening by watching the first episode of Star Trek, which I wasn’t wowed by, which is good because the rest of the series is going to be a paid show, and I only believe in paying for shows by watching commercials, a dying concept which has definitely contributed to the large number of books I’ve read this year. Category: arts,dc life. There is/are 4 Comments. 1. 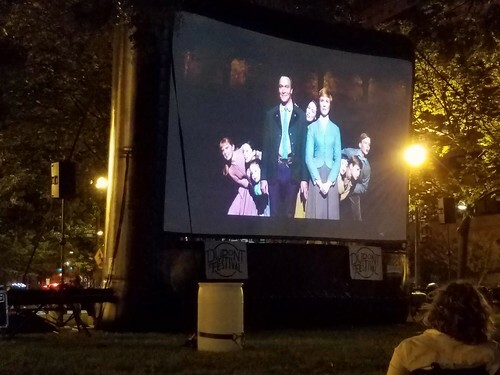 Tonight they showed The Sound of Music in Dupont Circle (it’s the park/traffic circle that gives our neighborhood its name, if you’ve never been here), and a nice-sized crowd showed up to watch. There seemed to be some teen boys in attendance who were very supportive of Maria, shouting, “You can do it!” when she gets intimidated by the Von Trapp’s estate and cheering enthusiastically when she & the Captain hook up. We applauded at the end of songs and whenever Nazis got their comeuppance or Austrians were told to hold strong against tyranny, giving the movie a far more political, and sadly relevant, feel than when I’ve seen it in the past. 2. I added a second night of volleyball to my schedule this week. (My brain thought there would be less overlap when I signed up, but it looks to be almost a month where I play twice a week.) The second team plays indoors and sometime after I enrolled, they switched it from a social league to a more competitive one, which made me a little nervous that my team would be a bunch of ultra-serious players who got cranky when we (read: I) screwed up. However, it seems at least half of us had jumped in before the league was re-designated, so it ended up being a pretty supportive group who were just there to play and have fun. I mean, granted, we were playing a team running plays in formations, while we were trying to get everyone on the same page of who was setting, but that was okay because we were enjoying ourselves. And while I was moaning over achy knees last night, this morning they were fine enough to run down the metro escalator, much to my relief. 3. Thank you everyone for your kind words after Posey’s death. It’s been a hard week, particularly when we go to bed and she’s not there to lie between us, but your good thoughts have helped to make it easier. Now part of Carole and Kat’s Three on Thursdays. This week, there’s more of the same in my reading and knitting, but further along in both. 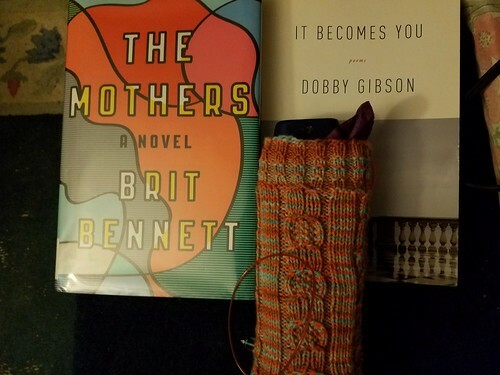 Still reading The Mothers by Brit Bennett, but nearing the two-thirds point where everyone in the story is doing stupid stuff, but you care about them remarkably. It Becomes You is a poetry collection by Dobby Gibson, a fellow alum from Connecticut College. I’m only a few poems in, but so far am enjoying it. On audio, I continue to listen to Lincoln in the Bardo by George Saunders, which has an excellent cast (and will likely do remarkably well at the Audie Awards this year). Because I tend to listen to audio books late at night, though, I find myself drifting off and needing to go back and find where I was, which is hard. I must experiment with the bookmarking option in Overdrive and see if that cuts down on the time spent trying to relocate myself. Little Pumpkins continue apace. I need one more repeat on the leg, or as it currently appears, umbrella cozy, and then will move onto the heel. I need to decide if I should reorient the pattern to have a single column of pumpkins parade down the center of my foot, as some others have done, or knit it as written, with the wide column of centered knits separating two columns of pumpkins. We’ll see. I’ll go back into the finished projects on Ravelry and see which I prefer. Either way, I’m really liking this combination of yarn and pattern, which I’d paired in my head years ago, and am eager to have the socks on my feet. I’m not positive that the yarn won’t bleed (since I seem to occasionally end up with dark patches on my fingers) and I won’t eventually have brown socks, but I’ll enjoy the “pumpkins and sky” colorway for as long as they last. 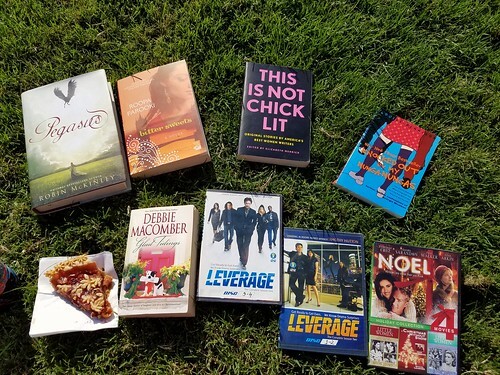 This week’s Top Ten Tuesday from The Broke and the Bookish invites us to share ten of the books we’re excited about reading this autumn. Dear Martin by Nic Stone tops my list, but this contemporary Y.A., which examines violent police interactions against black teen boys through the lens of Martin Luther King Jr.’s teachings, is due out in mid-October. Wonder Woman: Warbringer by Leigh Bardugo is in my possession. This title combines the mythology of Diana of the Amazons with Helen of Troy. Miles Morales, by Jason Reynolds: An alternative Spiderman story. This has been on my radar for so long that when the latest wall crawler movie came out, I was confused about why he was white. I was really looking forward to S.K. Ali’s Saints and Misfits when it first came out, but it hasn’t managed to jump from my coffee table to my bag, and I don’t know why. But I’d like to give it back to the library read, so I’ll give it a shot. Hidden Figures: The American Dream and the Untold Story of the Black Women Who Helped Win the Space Race by Margot Lee Shetterley: My coworker lent me her copy of the book back at the start of the year and I should give it back before the end of it. I really enjoyed Amy Salig (A.S.) King’s talk on Me and Marvin Gardens, her new middle-grade book, at the National Book Festival a few weeks back and now have a copy out from the library. People in my book group really raved about The Bear and the Nightingale by Katherine Arden and keep comparing it to Uprooted, which I loved, so now I have the audiobook copy out. I have tried to read Magic in Manhattan by Sarah Mlynowski the past two (maybe more?) autumns and I’ve failed to get past the first few chapters. My BFF, Karen, tells me it’s an adorable series, so hopefully this fall will be the charm. The 13 1⁄2 Lives of Captain Bluebear by Walter Moers is translated from the German and features the adventure of a seafaring blue bear and his family of mini pirates. 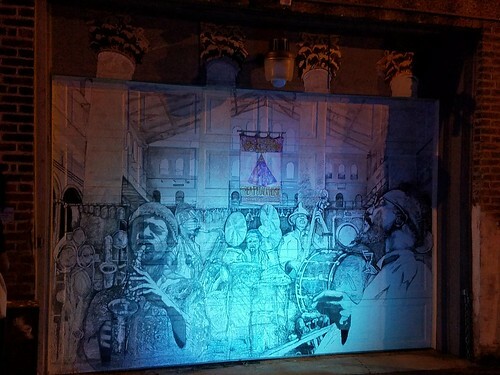 Shadowshaper by Daniel José Older looks at Caribbean-American ghosts who live in paintings, music, and literature in this seasonally appropriate book I downloaded via the YA Sync program this summer. How about you? What are you hoping to get to this fall? Sometimes I go days in between posts because I’m busy, and sometimes because I have nothing that seems important to say. Other times, it’s because the posts I should be writing (book reviews) require a lot of time and energy. And then there are times like the past couple days. Since I last wrote Thursday, I’ve opened my laptop and a new post page every day, and every day I’ve stared at the cursor blinking away like a heartbeat and closed it back up. Category: cats. There is/are 11 Comments.